A nitrile glove with the fit and feel of latex. UltraSense gloves are made from a patented next-generation nitrile formulation to provide comfort, while maintaining the reliable barrier protection of a synthetic glove. UltraSense gloves provides a precise grip in both wet and dry conditions, while offering comfort for extended periods of use. This is a soft nitrile glove with a latex fit. UltraSense™ has a precise fit, with ultra comfort and unwavering grip, conforming to your hand like latex. Unmatched quality and comfort in an affordable nitrile glove. UltraSense™ forms to your hand like latex, without the associated risks, and has elasticity unlike any other nitrile. High quality nitrile UltraSense™ provides reliable barrier protection against many hazardous and infectious substances. 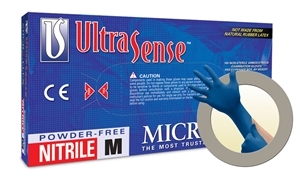 UltraSense™ forms to your hand like latex, without the associated risks, and has elasticity unlike any other nitrile.